Mostly rendered, the nave is C12, the tower is C13 and the chancel probably mainly C14 and there is a C13 wall-painting. 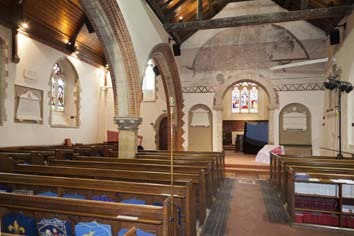 A large north aisle was added in 1898. Patcham, the northernmost point in Brighton, was joined to it by continuous building after the late 1920s. The parish had been mainly sheep-pasture since the late Middle Ages. 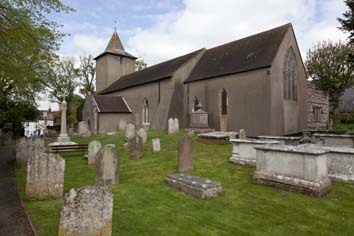 The area round the church, which is by a green up a lane from the A23, retains its village character. There was a church here in Domesday Book (12,5), but the cement render on the present one makes dating a problem. Reset in the C19 north aisle is a round-headed north doorway with a lintel formed from a monolith; possibly the plain tympanum was decorated. This has been called C11 (Fisher p162), on the assumption it was once taller. However, it is too retooled for certainty and was no longer in its original state by the time of the Sharpe Collection drawing (1802), which appears to show a square head, though this was probably because the rest was hidden beneath the render. It is known to have been already blocked in 1884 (5 p182). The chancel arch has a plain round head with renewed abaci. Shallow round-headed niches either side, now containing early C19 memorials, may once (VCH 7 p218) have opened into the chancel. Such a triple arrangement existed at Plumpton and remains at Pyecombe, West Sussex, the adjacent parish, though at the latter the arrangement is probably post-Reformation. 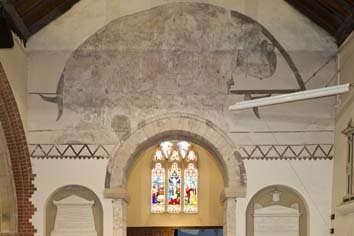 At Patcham, the chancel arch is plastered, but the proportions and round head look C12. 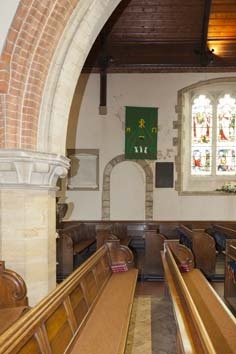 The nave walls and the western part of the chancel are probably of the same date, though there is no definite feature. A plain west lancet and small round-headed bell-openings show the west tower is early C13, as is the plain pointed and chamfered head of the tower arch (hidden by the organ). At much the same time the nave was remodelled. There remain a chamfered south doorway with a slightly depressed head and, possibly, parts of the south porch with a pointed arch. The north wall of the nave has gone, but though Quartermain (E p228) shows nothing obviously C13, the Sharpe drawing shows an apparently plain lancet near the west end of this side, as well as one in the chancel. Though this looks C13, a surviving trefoiled one on this side, now opening into the C19 vestry, suggests C14 work. This later date accords with the other detail of the chancel, including trefoil-headed south lancets (one a lowside), which taken together show it was remodelled and probably lengthened then. Though mostly renewed, the three-light east window with cusped intersecting tracery is as on the Sharpe drawing. A renewed quatrefoil-headed south east window also dates from this time. Less certain is a two-light square-headed north window, which could be C14 or C15; it is not dissimilar to a three-light one on the north side of the nave, visible in the Sharpe drawing. Similar uncertainties apply to the nave roof with queenposts, which is probably also C15, though it has been dated to as late as the late C16 (EH). The steeper east gable of the nave shows either that its predecessor had a lower pitch or it has been altered. Unusually, the Sharpe drawing shows the tower with a low-pitched roof. Sir Stephen Glynne in 1825 mentions an ‘Italian Parapet’ (SNQ 16 (Nov 1963 p57), an odd description for the battlements that Adelaide Tracy (1854) (III p60) and Nibbs (1851) show. In addition, Glynne regretted the cement render, as did Hussey (p264). The church was extensively altered at various times in the C19, but documentation for changes in the earlier years is poor. Nibbs in his notes mentions a repewing and repairs to the nave in 1824, which may reveal the date of the irregular buttresses of the tower and the west end, and there was a restoration in 1856 (Dale p201). It would be tempting to date the replacement of the roof on the tower by the present low broach spire to this date. The installation of new glass in the east window in 1869 (see below) may imply there had already been repairs to the chancel, whether then or in 1856, but the next certain date is 1875-76, when work was carried out mostly to the interior. This included the removal of the west gallery and opening of the tower arch (WSRO Ep II/27/203). The former reredos is by Somers Clarke junior (see below) and as it was dated 1875 this may indicate the architect of the whole restoration at that time, but there is no certainty and equal uncertainty about the date and authorship of the new chancel roof and the boarding of the nave one. A further restoration followed in 1883 by R Nevill (CDK 1884 Pt 2 p142), also affecting mainly the interior and costing £517 (KD 1899). An otherwise unrecorded but clearly substantial restoration by H Woodyer, said to have been carried out in 1887-88 (1 p212) refers to Patching church (West Sussex). There is no doubt about the architect of the latest C19 work, when a new north aisle was added in 1898. There is good primary evidence that this was designed by W. White (1 ibid), though it is not mentioned by Gill Hunter in her recent book on the architect and is one of his last works. The new work is in flint and brick and the broadly proportioned arcade is also partly brick. One further possible indication of work to Patcham church lies in a statement that J G Gibbins, a leading Brighton architect, designed an unidentfied church in Patcham (BAL Biog file). No more precise description is given and no date, but it is possible that he was in some way linked to one of the later restorations here. Regrettably and despite earlier criticism, the cement render was retained throughout this period and indeed renewed during repairs to the church about 1946 (information from the then vicar). Otherwise, changes since 1898 have been limited to the interior. They include the moving of the organ to a new gallery in the tower by Gotch and Partners in 1967 (ESRO Par 437/4/1/11) and repairs to roofs by L H Parsons in 1970 (ibid Par 437/1/11/13). More recently, the chancel was re-ordered in 1989, when the floor level of the chancel was extended over the eastern part of the nave and parts of the former choir stalls were re-used as panelling at the east end (EH). Font: Bulbous and round, dating from 1864. 1. 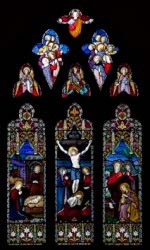 (East window) M O’Connor, 1869 (B 27 p593). 2. (South chancel, first and second windows and one north chancel window) These look like C E Kempe, even to incorporating a version of his arms, and are attributed to him in www.stainedglassrecords.org (retrieved on 18/3/2013), though without a date, but they are not included in Collins’s Corpus and their poor condition is unusual for Kempe’s work. It has been suggested after consultation with the Kempe Society that the condition and other details are consistent with Kempe’s work in the 1870s, though the heraldry presents some inconsistencies. However, further research is needed. 3. 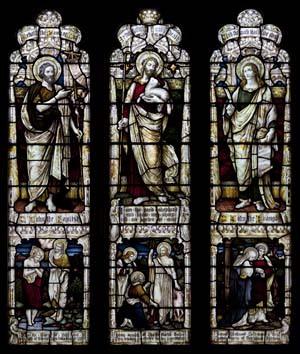 (North aisle, first window) W G Taylor, c1889 (signed). Brightly coloured and rather pictorial in design, particularly the angels in the tracery. Despite the dates given, this glass and the next also is more likely to have been made after the construction of the aisle in 1898 than to have been reset there, since the former north windows of the nave were different. 4. (North aisle, second and third windows) Heaton, Butler and Bayne, c1894-98 (Catalogue 1902). 5. (North aisle, west window) Heaton, Butler and Bayne, c1905 (Catalogue 1909). 1. (Chancel north wall) Richard Shelley (d1594). Though altered, it is remarkable for the two naked gravediggers flanking the central coat of arms. Between them are tapering pilasters with an inscription above. 2. (Chancel south wall) John Payne (d1805) by Williams of Brighton (Roscoe p1381) using multicoloured marbles. 3. (North aisle) Benjamin Tillstone (d1829). A plain white marble tablet signed W Lambert and Son of Brighton. It was clearly moved to a new position after the aisle was added. 4. Sir Chaloner Ogle (d1859) by W Pepper (BE(E) p275). It is assumed there that this must be Pepper junior, but his father was still active at the time and more consistent in his devotion to stone-carving, so he is preferable in the absence of certainty. Painting: (Above chancel arch) Last Judgement, found in 1880 (3 p80) and probably mid-C13. The colour is mostly lost and the outlines have been heavily retouched. The figure of Christ in the upper tier is clear, with angels on either side. The damned and redeemed souls beneath are harder to make out. Further fragments were found under monuments on the north wall (ibid), but were lost when this was removed in 1898. Piscina: (South chancel) C14 trefoil-headed with a fluted basin. Reredos: (Formerly) Somers Clarke junior, 1875 (B 33 p858).